This qualification will provide you with the opportunity to work in a sector where there are genuine employment opportunities, as well as providing you with an opportunity to make a difference. Plus, when you study with Aged Care Training Services, you know you are receiving the best training from experienced, qualified trainers and assessors as well as the support you need to achieve your career goals. If you are committed to the care and rights of elderly people, are physically fit, have empathy, discretion and a high level of professionalism, then consider taking the next step in your career by gaining this nationally recognised qualification. Learning and assessment occurs in two distinct phases. The first phase includes facilitated classroom learning combined with online learning and theory-based assessment. This is then followed by the practical placement phase where skills and knowledge are applied and practiced and work-based assessment occurs. The below units have been selected in conjunction with industry consultation, to offer a full range of competencies that will assist to design, implement, and evaluate leisure and health activities and programs for clients who are elderly or have a disability. The course takes 9-12 months to complete depending on a person’s prior experience. 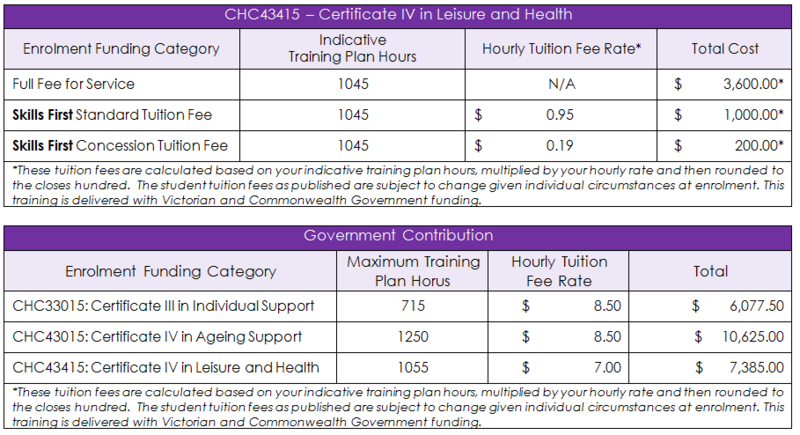 As part of your CHC43415 Certificate IV in Leisure and Health course, there is a minimum of 120 hours of work placement required. Placement is a great opportunity to put all your knowledge into practice. While you are on-the-job training you will be supervised and guided by experienced professionals who work at the facility and you will have scheduled visits from your trainer. This will give your trainer an opportunity to observe your competence to perform tasks at the standard required. Aged Care Training Services will arrange Practical Placement for eligible individuals where required! We work with a number of reputable facilities in the Melbourne regional and metropolitan areas. We always aim to place individuals in a facility that is close and convenient for their individual needs. Please Note: Practical Placement positions are at the discretion of the facilities availability and criteria. When individuals are attending any Aged Care Facility for Practical Placement they must wear a student uniform at all times. Aged Care Training Services will supply you with a polo shirt and a name badge. into CHC43415 Certificate IV in Leisure and Health . To ensure we meet your learning needs we will conduct an LLN before you enrol. No need to be discouraged about this as the LLN is a great tool to allow us to identify any extra support you may require. See our course calendar below to see when a course is starting near you. Skills First provides an opportunity to access Victorian and Commonwealth Government Funding to complete a nationally recognised qualification. This training is delivered with Victorian and Commonwealth Funding. Students with disabilities are encouraged to apply. Eligibility criteria applies. If you are enthusiastic, caring and are committed to the care and rights of elderly people and people with a disability, this qualification is another valuable pathway in your Community & Health career, or your stepping stone to a meaningful new career. 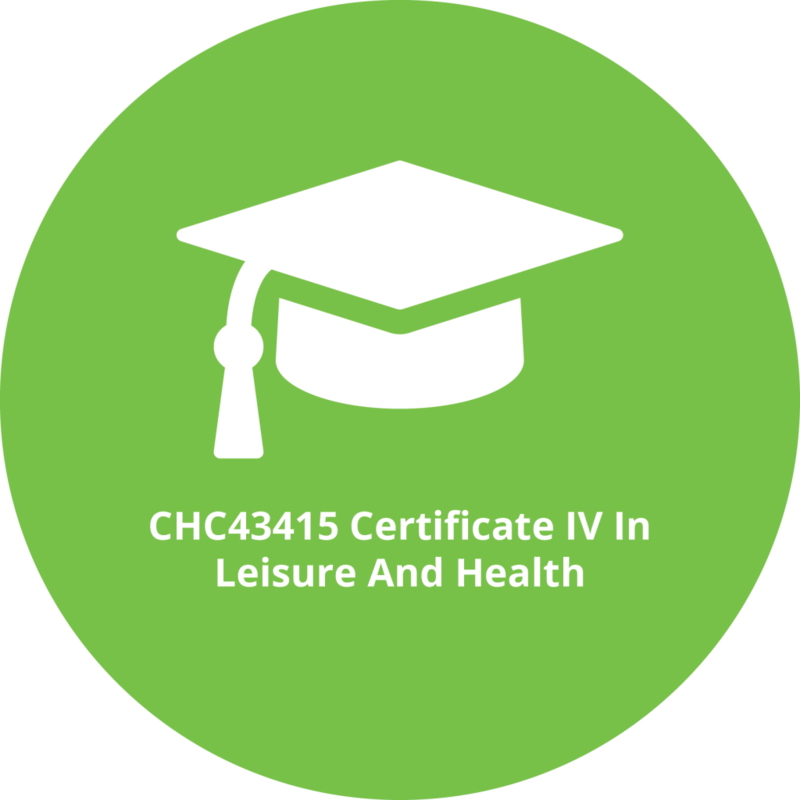 The CHC43415 Certificate IV in Leisure and Health is a nationally recognised qualification that equips you to design, implement, and evaluate leisure and health activities and programs for clients in residential facilities, community agencies, or day centres. Do you understand what the Victorian Training Guarantee is and the funding eligibility? Are you aware of the fees and charges relating to this course? View the table of available class dates by location on the right hand side, choose your course start date and click the “book now” button. After making a booking one of our staff will contact you to confirm your eligibility for funding, placement and payment options.